Thoughts from Both Sides of the Brain: What About Gas Prices? Note: "Everything Else" includes Gifts and Donations, Health and Fitness, Uncategorized (cash and some checks), Travel, Business Services, Personal Care, Pets, Entertainment, and Fees and Charges. I also separated "Gas and Fuel" from "Auto and Transport" to demonstrate my point. What's left in in "Auto and Transport" includes Parking, Services and Parts, Auto Insurance, and "Other" (state transportation fees). Restaurants, coffee shops, and alcohol were included in Food and Dining, but I split those out into "Restaurants, etc.". Our family probably does not spend like other families. We're generally fiscally conservative. We do like to buy good, healthy, and (when we can) local food, so our food prices are high. We don't splurge on electronics, entertainment, fancy phone or cable services, or personal care. We also minimize driving, which keeps auto costs lower. Both our drives to work are within 15 minutes. On the other hand we have a lot of educational debt. Even so, that's still a relatively small percentage of expenses. It should be no surprise that the top of the list is housing. That's probably true for just about anyone at any income level. So what concerns me more? The cost of fuel or something else? Even as the cost of gas has risen, I'm not as concerned as I am about the cost of food, which is partly related to the cost of gas. However, there are more insidious factors in the cost of food: Wall Street. [T]he boom in new speculative opportunities in global grain, edible oil, and livestock markets has created a vicious cycle. The more the price of food commodities increases, the more money pours into the sector, and the higher prices rise. Indeed, from 2003 to 2008, the volume of index fund speculation increased by 1,900 percent. "What we are experiencing is a demand shock coming from a new category of participant in the commodities futures markets," hedge fund Michael Masters testified before Congress in the midst of the 2008 food crisis. The result of Wall Street's venture into grain and feed and livestock has been a shock to the global food production and delivery system. Not only does the world's food supply have to contend with constricted supply and increased demand for real grain, but investment bankers have engineered an artificial upward pull on the price of grain futures. The result: Imaginary wheat dominates the price of real wheat, as speculators (traditionally one-fifth of the market) now outnumber bona-fide hedgers four-to-one. Today, bankers and traders sit at the top of the food chain -- the carnivores of the system, devouring everyone and everything below. Near the bottom toils the farmer. For him, the rising price of grain should have been a windfall, but speculation has also created spikes in everything the farmer must buy to grow his grain -- from seed to fertilizer to diesel fuel. At the very bottom lies the consumer. The average American, who spends roughly 8 to 12 percent of her weekly paycheck on food, did not immediately feel the crunch of rising costs. But for the roughly 2-billion people across the world who spend more than 50 percent of their income on food, the effects have been staggering: 250 million people joined the ranks of the hungry in 2008, bringing the total of the world's "food insecure" to a peak of 1 billion -- a number never seen before. 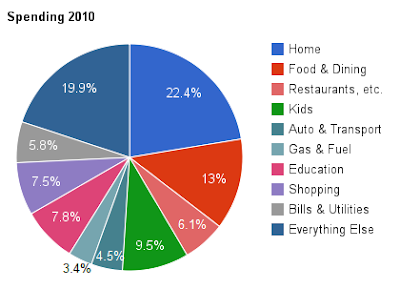 As you can see in my spending graph, "Food and Dining" consumes 13% of our budget, higher than the quoted 8-12%. This category originally included restaurants, coffee shops, and alcohol, which I moved into "Restaurants, etc. ", and was at 18.5% of spending. With these items removed, it seems much more reasonable, but still high. About 4 times higher than gas prices! Given that our expenditure is already higher than the estimate in the article, and that food prices are likely to increase due to this investment scheme as well as increased transportation costs due to gas prices, I am much more concerned about the cost of food. Occasionally I joke that my son eats so much I might as well buy a farm to feed him, and that's not that far from the truth. We do partake in local farmer's markets and a community farm, but even so, those prices will probably be affected too. So take a look at your own expenses and critically examine what's really costly. And once you figure that out, take action to reduce the costs however you can. For me, I'll chose to vote for politicians who push for financial reform and continue to buy as much local, organic food as I can.